The GoPro Supercharger provides a quick charge for your GoPro camera, and can charge two devices at once. You can still use your GoPro while it's charging, so it's perfect for longer shooting sessions. 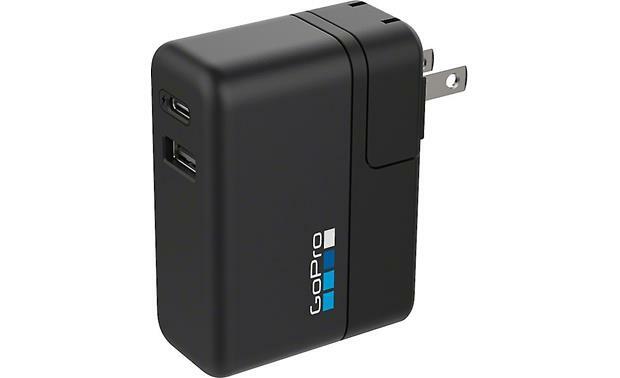 Overview: The GoPro Supercharger (International Dual-Port Charger) allows you to charge GoPro devices at the same time. It features a new fast-charge Type C USB port, as well as a conventional Type A USB port. It comes with four AC plug adapters, so you can use the Supercharger almost anywhere in the world. The Supercharger is compatible with all GoPro cameras and other USB devices. USB Type C: The USB-C port charges at a higher current, making it compatible with GoPro fast-charge devices (see list below). It charges at 5.1V-3A, 5.5V-3A, and 12V-1.67A, resulting in 20% to 70% faster charging times. It can also continuously power your GoPro for longer periods of time, such as during time-lapse photography. USB Type A: The conventional USB-A port charges at 5V-1A, and is compatible with all GoPro devices. HERO5 Black: The HERO5 Black (CHDHX-501) charges approximately 20% faster using the USB-C port. HERO5 Session: The HERO5 Session (CHDHS-501) charges approximately 20% faster using the USB-C port. Dual Battery Charger (for HERO5 Black): Using the USB-C port with the Dual Battery Charger lets you charge the batteries approximately 45% faster. Karma Grip: The Karma Grip (AGIMB-002) has a built-in Lithium-Ion rechargeable battery, which charges approximately 70% faster using the USB-C port.